Sculptors from around the world have created a park of unique sandstone works in the Living Desert open-air display just north of Broken Hill. At Esperance, on the southern coast of Western Australia, an abandoned tanker jetty is the place to see wild sea lions up close. To the north in Broome, rough-hewn rock headstones bearing Japanese inscriptions mark the graves of 900 Japanese pearl divers. And at the right time of the year in Tasmania, at Nabowla, visitors can stroll through a 48ha purple sea of flowering lavender. Travel, and the stimulating experiences which go with it, is increasingly becoming a way of life for thousands of Australians. Already this year, inland Queensland towns are reporting early sightings of the great Mexican migration; the seasonal shift of southern residents to fish, relax, explore and enjoy the many delights of a north Queensland winter. Others make the complete break; selling their homes, farewelling adult children and taking off on an endless nomadic journey of discovery around the continent. Over 14 years, Gold Coast couple John and Jan Tait have hauled camping trailers and caravans and steered mobile homes throughout the country. Their “tag-along” four-wheel drive tour business has taken them away to wild and wonderful places for up to 10 months at a time … and they love it. “We have a soft spot for the desert regions and the Red Centre, around Alice Springs, and the southwestern part of WA,” John says. Even after so much travel, John is the first to agree that there are countless places he has yet to visit. “The more we travel, the more places we say we’ve got to go back to when we’ve time,” he says. Carrying a computer, taking many of their own photographs and keeping meticulous records, the Taits have gathered a wealth of information for their fourth travel book, Explore Australia by Caravan. It is the work of people who know the road. They understand what novice nomads should and need to know. Within its 410 pages, this includes a vast spectrum of knowledge covering everything from safe towing tips to the realities of taking pets. 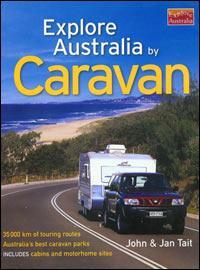 In all regions, the Taits have picked out caravan parks which earn their “authors’ choice” tag. In fact, the council-operated caravan park at Mitchell, in western Queensland, is one of the very few in Australia where John says visitors can stay free for the first two nights. Explore Australia recommends quality sites but some which are “not up to speed” earn a mention solely because there are no alternatives in that district. Mobile-home owners, in particular, favour free camping. Security issues and adverse publicity about robberies in remote places did effect the numbers of people using free camping areas – but not for very long, he says. “A lot of people travel on the basis of two free camps, then pay for one. That’s when they recharge batteries, top up water supplies and so on,” he says. Explore Australia has maps and detailed advice on specific routes, adding tips on interesting things to see en route, the best times of the year and thumbnail descriptions of places encountered. John says the book is a response to the tremendous increase in long-distance touring rigs observed on Australian roads in recent years. With 35,000km of touring routes covering all parts of the country, Explore Australia is not only for motorists planning the round Australia epic. It’s just as valid for people who want to plan an Outback trip for their annual holidays. It is an attractive companion to information available “on the ground” from volunteers in local tourist offices, pubs, shops and other locals.